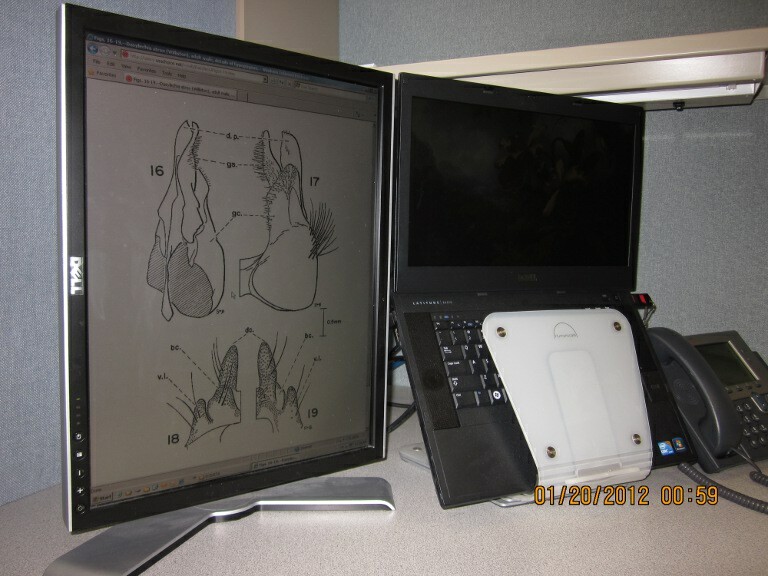 This is a laptop with a second screen, set up as it should be to view the types of plates I will be displaying here. The plate in the photo is one of part of the male terminalia of Dasylechia atrox, an oddball Laphriine fly. The second monitor is flipped sideways. A setup like this allows you to take in the entire plate at one glance. The original lettering on this plate as well as on most I've done was inked 25-30 years ago with a LeRoy letting set. Boy, have things changed. When I made this particular plate computers cost around ten thousand dollars each and came with all of 64 kilobytes of RAM. I remember making this plate well; I did it on Strathsmore board at my home at the time -- an 8x40 trailer in Laramie, Wyoming, on the edge of town, after work, with a dissecting scope and grid, light board, and rapidograph set, all of which I provided myself (and still have). At the time I worked full-time as a clerk in a junk store even further away from town but in another direction, and squeezed in classes and study for my PhD. as I could. In other words, I got these plates and many others completed under circumstances I'd never want to repeat. As for the trailer, I could look out the back window, away from town, and see nothing but prairie for miles and miles. I could see so far that approaching thunderstorms were discrete entities that could be tracked long before they hit. In short, you could see those babies coming. I sometimes think that graduate students pay too high a price for their Union Card; considering that once they've gotten a professional job many of them never do much else again, other than raise money. Raising money, of course is a job too; it takes lots of time and effort, and so I'd guess the explanation lies there. But it seems a waste to spend years training people for some extremely specialized activity like insect taxonomy, for which presumably they have some natural bent, and then, when they've been hired professionally, to immediately require as the sine qua non of remaining employed, that they spend the majority of their time writing grant proposals, instead of actually exercising and developing their acquired skill, when they could do the latter almost out of pocket money. The result is a tiered system of indentured servants in which nobody wins, lest of all society at large. I suppose it's a necessary evil. At least with funding the average doctoral candidate gets through in a reasonable period of time, even if he's not doing what he wants. And the average professor gets a pay check and security he'd otherwise be hard put to come by in the rough-and-tumble world of real business. In fact, generally I'd say grad students are so sick of the whole research gig by the time they've finished they're glad to be rid of it, like a pennant exorcising himself of a devil. I didn't go this route. But the road I did take certainly wasn't paved; it had its own ruts and washouts which may in the end have been far worse. It's a miracle in a way I'm still working on flies, even as an avocation. Or I should say, especially as an avocation. A week ago I ran a malaise trap in a woodlot I own, next to my log house. A photo is in the blog header. It's still very early Spring here (in west central Pennsylvania), the trees are not far removed from budding, and the ferns are only a few inches high. I hadn't run the trap this early before, so I thought I'd see what I got. The main catch seemed to be a variety of what-used-to-be empidids and mycetophilids and lots and lots of ichneumonids. But no robber flies. I did get a few xylophagids. Later in the year the traps are filled with several species of rhagionids. BTW, I hate to throw away the Diptera part of these catches, but I don't have time to process them for myself or anybody else. This is especially true if I have to pin anything. It's hard enough to process the robber flies. But sometimes I still get excited about the other flies, especially when robbers are absent, and the flies in question are Orthorhaphus Brachycerans, syrphids, or tachinids. But then I remember that I've got too much to do as it is. It's a shame life is so short. You'll notice that I finally redid the style of the blog, so that the width is variable, depending on the screen size; there are constant margins; and the main page has snippets of the more recent articles. My son kept telling me I had a nice-looking blog, for 1995. So I had to do something. It still doesn't have comments or search.